Sean Penn's "The Pledge" begins as a police story and spirals down into madness. It provides Jack Nicholson with one of his best roles in recent years, as a retired cop who makes a promise and tries to keep it. Like their previous film together as director and actor, "The Crossing Guard" (1995), it isn't a simple revenge story but shows the desire for justice running out of control and becoming dangerous. The story has the elements of a crime thriller (cops, suspects, victims, clues), but finally it's a character study, and in Detective Jerry Black, Nicholson creates a character we follow into the darkness of his compulsion. As the film opens, Jerry is retiring as a cop--a good cop--in Reno, Nev. He's from an earlier generation; you can see that by the way he looks for ashtrays in the offices of colleagues who don't smoke. News comes that the mutilated body of a girl has been found. Jerry goes on the call (he wants to work out his last day), and eventually finds himself delivering the tragic news to the parents of the little girl. This scene, staged by Penn on the turkey farm the couple operates, is amazing in its setting (Nicholson wading through thousands of turkey chicks) and its impact (holding a crucifix made by the murdered Ginny, he swears "by his soul's salvation" that he will find the killer). This is the pledge of the movie's title, and eventually it obsesses him. It appears at first that the killer has been found. Benicio Del Toro plays an Indian, obviously retarded, who was seen running away from the murder scene. Clues seem to link his pickup truck with the crime. A knife-edged detective (Aaron Eckhart) gets a confession out of him, with Jerry squirming behind the one-way glass and saying the Indian "doesn't understand the question." Then the Indian grabs a gun and shoots himself. Guilty, and dead. Case closed. Jerry doesn't think so. His years as a cop tell him something is not right. In retirement, he continues to investigate the case, eventually finding that the dead Ginny had made friends with a "giant" she called "The Wizard." Who was this man? Was he the killer? Was he linked with other unsolved killings of young children? 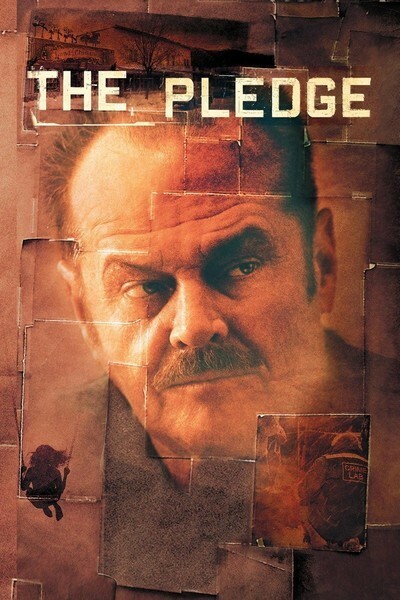 Until this point, "The Pledge" has been a fairly standard, if well-done, police procedural. Now Penn, working from a novel by Friedrich Durrenmatt and screenplay by Jerzy Kromolowski and Mary Olson-Kromolowski, begins the film's descent into Jerry's obsession. He does a strange thing. He buys a gas station and convenience store halfway between two towns where he thinks the Wizard might have committed crimes. Studying drawings by the dead Ginny, he thinks he knows what kind of vehicle the killer might have used. The store is a trap. An unexpected thing happens. He meets a mother (Robin Wright Penn) and her young daughter, and they feel an instinctive sympathy that blossoms, to his surprise, into love. After a couple of divorces, Jerry discovers at last what a happy domestic life can be. We immediately realize that the daughter is a potential victim of the killer, if he is indeed still at large. We assume Jerry realizes this, too. But surely he would not use this beautiful little girl as bait? One problem with Jerry's quest is that he is the only person who believes in it. His former police colleagues think he's gone around the bend; even the chief (Sam Shepard), an old friend, looks sadly at Jerry's unhinged zeal. His gas station trap may be a long shot, or an inspiration, or simply proof he's losing touch with reality. The last third of the movie is where most police stories go on autopilot, with obligatory chases, stalkings and confrontations. That's when "The Pledge" grows most compelling. Penn and Nicholson take risks with the material and elevate the movie to another, unanticipated, haunting level. Sean Penn has been saying for years that he wants to quit acting and be a director. That would be a loss because he is one of the finest actors alive (consider "Dead Man Walking"). What is clear from the three films he has directed (also including "The Indian Runner" in 1991) is that he has no interest in making ordinary films. He is fascinated by characters under stress. He is bored by the working out of obvious psychological processes. The character of Jerry here is not merely a good cop, but a retired man, an older man, a man possessed by a fixed idea. He is able at one level to exude charm and stability (one reason the younger woman likes him is that he offers calm and strength after her violent marriage). But we sense deeper, darker currents, and issues he isn't fully aware of himself. By the end of "The Pledge," the suspense hinges mostly on Jerry, and the solution of the crime is a sideshow. It is here that Nicholson's skill is most needed, and most appreciated: He has to show us a man who has embarked on a terrifying and lonely quest into the unknown places of his mind.